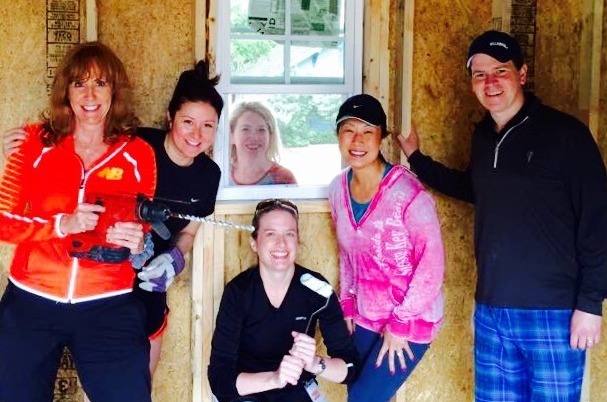 It’s easy for a company to say they “give back to the community”, but what exactly does that mean? For Global Wealth Advisors (GWA), social giving can be found in the heart of our company and in the hearts of our employees. At GWA we not only talk the talk, but we walk the walk, doing more than just cracking open a wallet – it means we roll up our sleeves and get to work. In a collaborative effort to advance services to Dallas’ homeless children, our newest team member, Kevin M. Curley, II jumped at the opportunity to spruce up the Vogel Alcove facility while participating in the Dallas Regional Chamber’s Leadership Dallas program. The volunteer effort meant constructing a new shade structure for the basketball court with cabling and colorful shades, building two much needed storage facilities for play equipment and painting murals to help inspire the children who use the facility. In all, the group provided almost $250K in upgrades to the homeless outreach center. According to Vogel Alcove, Dallas has the sixth largest GDP of any American city, but also one of the highest child poverty rates in the country. The organization helps homeless children work through the emotional, physical and mental trauma they suffer by offering a NYEAC accredited early childhood program, school-age camps held when Dallas ISD is closed and family support including case management, access to resources, training and support.